Liver Pâté was never a recipe I had a desire to try. But, being on the GAPs diet, I have learned that one of the more easily digestible meats is liver and especially Liver Pâté. Oh, as a young girl, I really liked Liver and Onions. In my hometown, there was a restaurant called Shoney’s that had it on the menu – I would order it every Sunday after church. But, as I grew up and the restaurant was no more, I forgot about the good taste of liver. I had no idea back then, just how good for you liver is! It is one of the most nutritionally packed meats! Liver is a great source of nutrients that many people with autoimmune diseases are lacking, including B vitamins, iron, zinc, and vitamins A and D! Also, did you know that ounce per ounce, liver has twice the folate as spinach? Folates are important for women in their child-bearing years and the lack of folate is linked to birth defects. Considering that liver is packed with folate, vitamin A and retinol (both needed during pregnancy), it is an important food for reproductive health and the health of a developing baby. I know, many people do not like liver. Just the thoughts of eating an organ meat make some squeamish. But, liver is an important food and one worth trying multiple times so as to develop a taste for it! When we butchered our first steer, he had an 18 lb liver! But, with our family size, we went through that quickly. Did I say that even our 4 yr old likes liver? So, with 9 people minimum eating, 18 lbs went fast. That is how I found my affiliate, US Wellness Meats. If you don’t have a trusted source of good quality grass fed liver (as well as other grass fed meats) check out my affiliate partner, US Wellness Meats. I have been well pleased with their products. If you have never worked with liver before, let me prepare you. Liver has a slippery, slimy feel which is one reason I find cutting it into pieces with scissors easier than using a knife. Then, there is the blood. But, don’t let that deter you. Take a deep breath, rinse the liver under running water and go for it – you will be glad you took the time to try Liver Pâté. 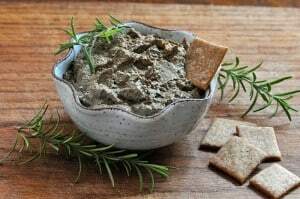 The following Liver Pâté recipe works great as a dip for fresh veggies if you are on the GAPS diet and if you aren’t, it tastes great with Homemade Wheat Thins, other crackers and bread. In the following recipe, I have linked to products from my affiliate partners that I personally use and recommend. 4 Tbsp butter at room temp - make your own! Soak liver (in the refrigerator) in buttermilk or kefir to reduce the bitter flavor. After 24 hrs, drain, rinse and pat dry. Saute liver, onions and garlic in 4 Tbsp butter until the liver is browned and onions are translucent. Add wine, mustard, herbs and lemon juice. Cook uncovered until most of the liquid is gone. Cool and blend to a smooth paste in the food processor. For a smoother and creamier consistency, add sour cream anywhere from 1/2 cup to 1 cup to the above recipe once it is blended to give it that little extra creaminess. And just for your FYI - I like to use a whole cup of cultured sour cream!